I chose this cruise because I had always wanted to go to Alaska and since I am a solo traveler, I thought this would be the easiest way to see Alaska. A little bit about me - I am a woman in her 30s who lives in NYC, travels solo, and usually takes land trips to Europe. 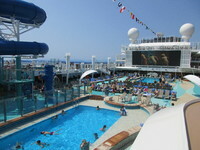 I am not a bigger cruiser but have been on two other cruises before with Carnival. Pre-Cruise On the advice of my co-worker, who loves to cruise, I booked dinners and shows in advance. I was only able to get the 10:30 show reservations because apparently booking two months before is not early enough. I never ended up going to the shows because I was still on NYC time and it was just too late for me. Seattle I flew to Seattle a day early because I had never been to Seattle before and wanted to leave enough time before my cruise. I stayed at a hotel near the Space Needle. This area looks like it was probably a seedy area at one time that is now being gentrified by Amazon. However, you feel about it, Amazon has brought in hip restaurants and shops so there is a lot of places to eat around here. I had good ramen across the street from Amazon&apos;s The Spheres. Of course Pike Place market was a tourist trap and worried about pickpockets, I didn&apos;t spend much time there. Embarkation The next day, I took the hotel shuttle to the pier. We left the hotel at 12 noon and I was on the ship probably by 12:30. Embarkation was very easy and fast. The rooms were not ready until about 2 p.m. and bags were delivered shortly thereafter. Room I stayed in a studio room intended for a single person. I would say most of the people who stayed in these rooms appeared to be traveling with other people but just wanted their own rooms. They did not appear to be solo travelers. The room was not bad during the day but at night when I turned the light off, I felt like I was sleeping in a coffin. I would wake up on the verge of having a panic attack so I had to sleep with the tv on and the shade of the faux window open so it wasn&apos;t so dark and oppressive. The first night it got hot in the room and I had to call someone to come and fix the air conditioning because the warmth combined with the coffin feel was making me feel claustrophobic. Needless to say, I did not sleep well during the cruise and would not stay in one of these rooms again. In addition, people kept slamming the doors at night - clearly they aren&apos;t used to living in apartments - and since I went to bed early as I was on NYC time, I kept being woken up by slamming doors. Gym On sea days, the gym was mobbed. You have to sign up for spin, yoga or other classes as soon as you get on the ship as they book up right away. I found this annoying because how do I know if I want to go to spin class five days from now at 9 a.m.? There was also an additional charge for the classes. I managed to book a boot camp class that was allegedly $20 for one hour. However, when the instructor came, he said it was only half an hour. There were also about four Cuban people in the class who insisted on talking really loudly in Spanish to each other the entire class. It was really odd. Observation Lounge Since my room was basically a coffin, I spent most of my time in the observation lounge. On sea days in the morning it was virtually impossible to find a seat and I would sit outside on the deck. But after lunch it usually emptied out. Yes, there were people napping on the couches or lounge chairs but it didn&apos;t bother me. Those cabins are so small that there is really nowhere for people to go. However, I did not appreciate people taking their socks off and lounging with their bare feet. No one wants to see a person&apos;s gnarly feet! I also found that there were constantly hordes of pre-teens running around the observation lounge screaming on the tops of their lungs. The observation lounge was a place people were using to read or nap and so the screaming was obnoxious. The pre-teens and kids were also constantly running up and down the cruise ship stairs. Food I thought the food was good. I ate in the dinning rooms for the most part and enjoyed the food. I ate at the buffet a few times but it was always so loud and crowded that I preferred dining in the dining rooms, which were quieter and more relaxing. 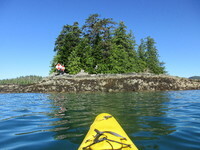 Excursions In Ketchikan, I did a sea kayaking tour. I enjoyed the tour - we got to see whales and sea lions. The company would not let us go out in our own kayaks so I had to share a kayak with a stranger but it worked out OK. I only had a little bit of time after sea kayaking to explore the town before I had to get back on the ship. In Juneau I did a hiking excursion, which was a my favorite. There was even less time in Juneau and had to go back to the ship immediately after. Skagway was probably my favorite stop. So pretty. It reminded me of being in Yosemite. I did the Klondike biking excursion, which was least favorite excursion. They drove us up a highway and then we biked down this highway on mountain bikes. The road was so steep and we were going so fast that I was was just concentrating on not losing control of my bike. There was no opportunity to look around at the scenery so what was the point? Note that I am an experienced biker and this was probably the scariest bike ride I have ever been on. In Victoria I paid to take the shuttle into town and then walked around for a bit. There was not a lot of time. I did have a chance to walk along the water when I came back to the ship and that was really nice. Things to Do on the Ship Basically, there was nothing to do on the ship. All the activities were activities in which Norwegian is trying to sell you something - ugly art, crappy jewelry, etc. Most people seemed to spend sea days hanging out drinking all day. Some started their drinking as early as 10 a.m. On sea days, I spent the entire day reading. There was far too much down time on the ship for me. I was starting to go stir crazy and at the end, was desperate to get off the ship. In Victoria, I got panicky when I thought about having to get back on the ship again. In Seattle, I was one of the first people off the ship and was grateful to be back on land. Overall Overall, I am glad I got to see some of Alaska and Seattle because I had always wanted to go to these places. However, if I was going to do it again, I would fly to Alaska and then sale on Princess south so I can stop more places in Alaska and spend less time on the ship. I would not sail Norwegian again because they nickle and dime you for everything and I don&apos;t like that I have to book every detail of my trip months in advance. Deck of the ship on embarkation day. 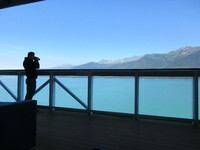 Deck of the ship while cruising to see a glacier. I chose this cruise because I had always wanted to go to Alaska and since I am a solo traveler, I thought this would be the easiest way to see Alaska. A little bit about me - I am a woman in her 30s who lives in NYC, travels solo, and usually takes land trips to Europe. I am not a bigger cruiser but have been on two other cruises before with Carnival. On the advice of my co-worker, who loves to cruise, I booked dinners and shows in advance. I was only able to get the 10:30 show reservations because apparently booking two months before is not early enough. I never ended up going to the shows because I was still on NYC time and it was just too late for me. I flew to Seattle a day early because I had never been to Seattle before and wanted to leave enough time before my cruise. I stayed at a hotel near the Space Needle. This area looks like it was probably a seedy area at one time that is now being gentrified by Amazon. However, you feel about it, Amazon has brought in hip restaurants and shops so there is a lot of places to eat around here. I had good ramen across the street from Amazon&apos;s The Spheres. Of course Pike Place market was a tourist trap and worried about pickpockets, I didn&apos;t spend much time there. The next day, I took the hotel shuttle to the pier. We left the hotel at 12 noon and I was on the ship probably by 12:30. 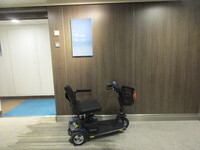 Embarkation was very easy and fast. The rooms were not ready until about 2 p.m. and bags were delivered shortly thereafter. I stayed in a studio room intended for a single person. I would say most of the people who stayed in these rooms appeared to be traveling with other people but just wanted their own rooms. They did not appear to be solo travelers. The room was not bad during the day but at night when I turned the light off, I felt like I was sleeping in a coffin. I would wake up on the verge of having a panic attack so I had to sleep with the tv on and the shade of the faux window open so it wasn&apos;t so dark and oppressive. The first night it got hot in the room and I had to call someone to come and fix the air conditioning because the warmth combined with the coffin feel was making me feel claustrophobic. Needless to say, I did not sleep well during the cruise and would not stay in one of these rooms again. In addition, people kept slamming the doors at night - clearly they aren&apos;t used to living in apartments - and since I went to bed early as I was on NYC time, I kept being woken up by slamming doors. On sea days, the gym was mobbed. You have to sign up for spin, yoga or other classes as soon as you get on the ship as they book up right away. I found this annoying because how do I know if I want to go to spin class five days from now at 9 a.m.? There was also an additional charge for the classes. I managed to book a boot camp class that was allegedly $20 for one hour. However, when the instructor came, he said it was only half an hour. There were also about four Cuban people in the class who insisted on talking really loudly in Spanish to each other the entire class. It was really odd. Since my room was basically a coffin, I spent most of my time in the observation lounge. On sea days in the morning it was virtually impossible to find a seat and I would sit outside on the deck. But after lunch it usually emptied out. Yes, there were people napping on the couches or lounge chairs but it didn&apos;t bother me. Those cabins are so small that there is really nowhere for people to go. However, I did not appreciate people taking their socks off and lounging with their bare feet. No one wants to see a person&apos;s gnarly feet! I also found that there were constantly hordes of pre-teens running around the observation lounge screaming on the tops of their lungs. The observation lounge was a place people were using to read or nap and so the screaming was obnoxious. The pre-teens and kids were also constantly running up and down the cruise ship stairs. I thought the food was good. I ate in the dinning rooms for the most part and enjoyed the food. I ate at the buffet a few times but it was always so loud and crowded that I preferred dining in the dining rooms, which were quieter and more relaxing. In Ketchikan, I did a sea kayaking tour. I enjoyed the tour - we got to see whales and sea lions. The company would not let us go out in our own kayaks so I had to share a kayak with a stranger but it worked out OK. I only had a little bit of time after sea kayaking to explore the town before I had to get back on the ship. In Juneau I did a hiking excursion, which was a my favorite. There was even less time in Juneau and had to go back to the ship immediately after. Skagway was probably my favorite stop. So pretty. It reminded me of being in Yosemite. I did the Klondike biking excursion, which was least favorite excursion. They drove us up a highway and then we biked down this highway on mountain bikes. The road was so steep and we were going so fast that I was was just concentrating on not losing control of my bike. There was no opportunity to look around at the scenery so what was the point? Note that I am an experienced biker and this was probably the scariest bike ride I have ever been on. In Victoria I paid to take the shuttle into town and then walked around for a bit. There was not a lot of time. I did have a chance to walk along the water when I came back to the ship and that was really nice. Basically, there was nothing to do on the ship. All the activities were activities in which Norwegian is trying to sell you something - ugly art, crappy jewelry, etc. Most people seemed to spend sea days hanging out drinking all day. Some started their drinking as early as 10 a.m. On sea days, I spent the entire day reading. There was far too much down time on the ship for me. I was starting to go stir crazy and at the end, was desperate to get off the ship. In Victoria, I got panicky when I thought about having to get back on the ship again. In Seattle, I was one of the first people off the ship and was grateful to be back on land. Overall, I am glad I got to see some of Alaska and Seattle because I had always wanted to go to these places. However, if I was going to do it again, I would fly to Alaska and then sale on Princess south so I can stop more places in Alaska and spend less time on the ship. I would not sail Norwegian again because they nickle and dime you for everything and I don&apos;t like that I have to book every detail of my trip months in advance. I would say most of the people who stayed in these rooms appeared to be traveling with other people but just wanted their own rooms. They did not appear to be solo travelers. The room was not bad during the day but at night when I turned the light off, I felt like I was sleeping in a coffin. I would wake up on the verge of having a panic attack so I had to sleep with the tv on and the shade of the faux window open so it wasn&apos;t so dark and oppressive. The first night it got hot in the room and I had to call someone to come and fix the air conditioning because the warmth combined with the coffin feel was making me feel claustrophobic. Needless to say, I did not sleep well during the cruise and would not stay in one of these rooms again. In addition, people kept slamming the doors at night - clearly they aren&apos;t used to living in apartments - and since I went to bed early as I was on NYC time, I kept being woken up by slamming doors.